Two gorgeous science books, BABY LOVES QUARKS! 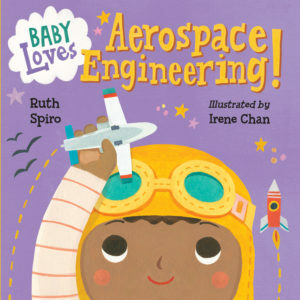 and BABY LOVES AEROSPACE ENGINEERING!, written by Ruth Spiro (illustrated by Irene Chan) released earlier this month from Charlesbridge. Being a science nerd, I instantly fell in love with these gorgeous and engaging books. 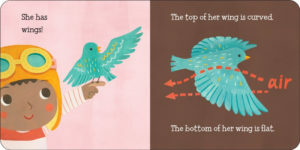 So I’m extremely pleased to have author Ruth Spiro join us on Picture Book Builders and answer a few questions about her adorable new titles. 1. How did you get the idea to write about science concepts for very young children? I like to think that as a writer, part of my job is discovering the ideas swirling around me – and often they come from surprising places! Readers may recall a controversial article that appeared in The New York Times back in 2010. “Picture Books No Longer a Staple for Children” (www.nytimes.com/2010/10/08/us/08picture.html) hit a nerve in the publishing community because of the misguided choice some parents were making to bypass picture books for their very young children in favor of more “sophisticated” reading material. I was discussing the article with friends and asked, “What do these parents want, quantum physics for babies?” As soon as I said it, I knew it was an idea I could work with. 2. Were there any special challenges you faced in sharing higher-level science material for your young audience? Yes, there were several! First, I’ve never considered myself a “science” person; my professional background is in business and advertising. However, I enjoy learning about new things and finding out how things work. While researching these books I had to learn about some very complex subjects, and also understand them well enough to isolate the main ideas and relate them to my readers. Another challenge was that I’d never written for an audience this young. So, I spent a good amount of time studying the types of books that are appropriate in these early developmental stages, and also read scholarly articles about the acquisition of language in babies. One trade book I found particularly helpful was “Reading Magic” by Mem Fox. Her books are beloved favorites for very good reason. Ultimately, I decided that the science concepts would be most meaningful if I could relate them to everyday moments and activities familiar to babies and toddlers. But I want to emphasize that my goal in writing these wasn’t to “teach” science to very small children, but rather to encourage exploration and wonder while introducing the idea that science explains many things we see every day. These are the kind of books I would have loved reading with my two daughters when they were small, because I would have learned a thing or two myself! 3. How did you vet your content? Before acquiring the series, Charlesbridge sent the manuscripts to an educational consultant to make sure they were developmentally appropriate. Once the text was finished, my editor asked me to find an expert to review it for accuracy. Coincidentally I’d met Dr. Fred Bortz, (http://www.fredbortz.com) a physicist and children’s book author, and also a fellow attendee at Jane Yolen’s Picture Book Boot Camp. I knew he would be the perfect person for the job because he’s super-smart and has written extensively on science topics for kids. He’s also bubbling over with enthusiasm for science, and a stickler for detail. I was ecstatic when he agreed to review both the text and illustrations. 4. In your writing process, how did you manage to create a narrative arc while also sharing interesting science content? After researching (and understanding!) the science itself, this was probably the biggest challenge. I decided to establish a main character, Baby, and then introduce the concept through a familiar activity or experience. For Baby Loves Quarks!, a natural parallel between nature building with molecules and Baby building with blocks emerged as the perfect way to tell the story. Baby Loves Aerospace Engineering! is about flight, from birds to planes and rockets. Once I had this framework in place, I wrote each story with a beginning, middle, and a fun, slightly surprising ending. Oh, and I kept each book to fewer than 100 words! 5. The illustrations are so colorful and engaging. What surprised or interested you about the illustrations? Irene Chan has done an amazing job with the illustrations. She’s new to illustrating children’s books, but is a prolific graphic designer. 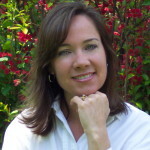 Her work appears on greeting cards, fabrics, games, puzzles and many other items. I was amazed by her attention to detail and her ability to not only personify a quark, but also make it look cute! Also, the faces she designs are adorable and appealing, perfect for a baby book. When I first proposed the series, I imagined it would follow the same Baby as the main character through all of the books. The brilliant folks at Charlesbridge came up with the idea of featuring a different Baby in each book, which gives us the opportunity to more accurately reflect the diversity of our readership. 6. Did you propose your books as a series, or did the first book lead to a series? As I pursued the idea, I drafted several stories to make sure the framework would fit with a variety of science topics. Then after researching and writing five manuscripts, I realized that because of their unique nature an editor would need to see more than one to understand my vision. I picked three stories I felt were the strongest and pitched them as a series. Alyssa Pusey, my editor at Charlesbridge, signed up two of those initial three to begin the series. 7. How was it decided that your book would be published in board book format? I pitched the series as board books because they fit well in that format and I’d written them with specific page turns in mind. Also, the rhythm of the text and depth of content just seemed to work best as board books. 8. What’s coming next from you? I’m happy to report that two additional titles, Baby Loves Thermodynamics! and Baby Loves Quantum Physics!, will be published in 2017. I’ve seen early sketches and they’re just as adorable as the first two! I have more good news about another picture book series but can’t reveal the details just yet… watch for an official announcement very soon! Charlesbridge, Irene Chan, Ruth Spiro, science books. Bookmark. I would have loved to read these books to my babies and can see a lot of people giving them as gifts. Great concept! Thanks for sharing how you came up with these books! How fascinating! Congratulations on your upcoming books! The “backstory” on your inspiration and writing/researching methods for this series was so helpful. Thanks for a great post…I can’t wait to read them all! Thanks, Tanya! Glad to hear my story was helpful. I do hope you’ll read them all! What a great idea and thanks for sharing your process. Can’t wait to see and read them. What a great idea to use constructs that are in kids’ lives to explain harder science concepts! Bravo on your success. Charlesbridge is one of my fav houses! Thanks, Kathy! Charlesbridge has been a dream to work with! Thank you for this interview. Love the story on how these books came to be. Can’t wait to get my hands on one! Thanks, Erin! I hope you enjoy the books when you finally get your hands on them! Ruth, I recently had a critique with an agent for a NF I’m doing and she mentioned your “Baby Love” series of a great example on how to write NF for the very young audience. I had never heard of this series and now I “see” you on one of my favorite blogs. Can’t wait to check out these books! Congrats on the series! Wow, what a coincidence! I wonder if it was my agent you spoke with. Thank you for sharing your process on writing. The pictures are so adorable too! Can’t wait to get them for my granddaughter. Thanks, Dorothia! Didn’t Irene do a wonderful job with the illustrations?! I couldn’t have been more pleased. Wish I had had the whole series for my ‘baby’, a math/physics genius who turns 27 this week. This is a great idea, and the illustrations are adorable. I think you have a winner. Thank you for sharing this. Ha! Well, your 27 year-old still might enjoy them, at least for a chuckle! Thanks! I’m happy to see these science concept books for very young children. I can’t think of any other books like these! I look forward to checking these out. What a fun concept! Can’t wait to read this cute books and I have the perfect baby to gift them to! That’s wonderful, Jennifer! I hope the baby enjoys them! Fun! I can see older siblings reading these to littles and learning a thing or two! Same goes for the parents! Congratulations! Hi, Angie! Yes, that’s just what I’m hearing, older siblings reading these to their little ones. Thank you! What a great idea! These books are adorable – love that color palette! Congrats! These look fantastic, and i can’t wait to seek them out. Such a great idea, and I loved the story behind your stories. Thank you! So happy to have the opportunity to share my story here! Thanks for the kind words about my contributions. What fun it was/is to work with you and Alyssa on these books! Thanks, Fred! It was fun working with you, as well! What an incredible idea! I love the illustrations too. I need to read these to learn a few things because I have no idea what a Quark is! 🙂 Congratulations Suzanne & Irene! Thank you, Debbie! My friend said the same thing when she read my book and learned what a Quark is! i know one little boy who would eat these books up! I hope he enjoys them – they’re quite tasty! These sound like such amazing stories. I love your idea and the story behind it. I think it is SO neat that Ruth’s idea came from her statement, “what do these parents want, quantum physics for babies?” I also really enjoyed hearing about her research process. These books sound great! I would never have dreamed of writing about such complicated science ideas for the very young. Congratulations! Thanks, Kristi! It turns out they’re not all that complicated once you break them down to the basics. My daughter AND her engineer father would love these! What a unique and fun take on science for the youngest! Can’t wait to share these with our patrons at the library. Thanks, Janet! I hope your patrons enjoy them! So wonderful and adorable — wish these were around when my no-so-little one was little! Congratulations Ruth! Love the question about finding your expert reviewer – kizmet! Yes, it’s amazing how things can work out! Thank you! I can’t wait to read these books! Science and picture books are my favorite things. What a creative concept. Thanks for the detailed article.What a great idea! Would make perfect baby gifts. Yes, that’s what I’m hoping! Thank you! Thanks for sharing your story to publication. These sound like really adorable books. I can’t wait to read them! Congrats! What a cool concept…congratulations on the series! Looking forward to reading all the books!!! Thank you, Judy! I hope you enjoy them! I love how you came up with the concept!! See? If we just pay attention to everything around us . . . !! Congratulations! That’s what a writer’s notebook is for – collect random ideas and observations and eventually they come in handy! Ruth, what a wonderful idea for board books. Perfect for the little ones I know! Thank you, Cathy! I hope your little ones enjoy them! Such a wonderful concept for very young children. My son is an electrical engineer, oh how he would have loved these books! What a cool idea. Introducing these ideas to a little one makes these complex subjects a little more mainstream. Who know how many future scientists are having these books read to them at this very moment!!! I hope there are many! Thanks, Cindy! The Baby Loves Science series is an amazing opportunity for little ones to learn, grow and discover. As an educator I support STEM teaching. Ruth, I enjoyed reading how your idea became a series of board books and all of the research you did. A few days ago, a package arrived in the mail. 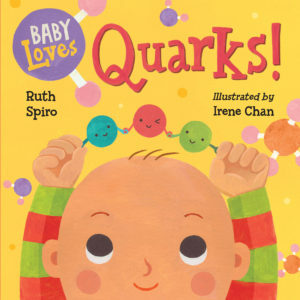 Inside was the book, BABY LOVES QUARKS! I am thankful to be a recipient of a Goodreads Giveaway. 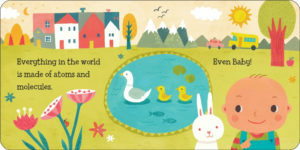 Please do not include me in this Picture Book Builders giveaway. Thank you, Suzanne & Ruth. Wow! What a coincidence! You’re lucky, as over 1,000 people entered the giveaway. I hope you enjoy the book! I can’t wait to read this books. Being a science girl myself. Thanks for the interview! Thank you, Darshana! Hurray for science girls! Ruth, it was wonderful learning about your new books! Good for you for realizing that difficult science concepts can be concretely explained to babies and toddlers. And I’m looking forward to hearing your upcoming good news! Kids are born scientists, but somehow this gets lost in schools. Your books encourage children to keep asking those good questions! Thanks, Beth. Continuing to write these books is certainly the plan! These sound fantastic! Are you familiar with Randall Munroe (his books WHAT IF and THING EXPLAINER, his Ted Talk, his comics…). If not, check him out! Hi, Anna! Thanks for the suggestion, I’ll definitely take a look! Hey, Ruth–great to have you here at PBB! These look fantastic–terrific idea, and beautifully executed (I’m pretty sure reading them would improve my science IQ too). Congratulations, Ruth, and thanks for a great interview, Suzanne! Hi, Linda! 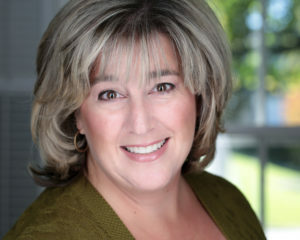 I was honored when Suzanne asked to interview me for PBB – I’m a fan! Hope you’re well. Really wonderful concepts with beautiful illustrations. Definitely plan to check these out. Thanks for bringing them to my attention. Thank you, Rachel! I agree, Irene did an amazing job on the illustrations! Wow! The books look amazing and it is so interesting to learn how Ruth went about making such complex topics understandable. Can’t wait to share these with a special baby. What an outstanding idea for a picture book series. I well recall when I was trying to understand nuclear power plants so that I could make intelligent comments at a hearing, someone told me to go find a picture book describing their workings to young children. It worked and was a great help to me. Thank you for writing this important series! Yep! I focus on the transfer of energy! Wonderful idea! I can’t wait to read them. Thank you, Jena! I hope you enjoy them! These are excellent books Ruth Spiro. I have used them for Science Storytime at the Mason Library. I can’t wait to see the Thermodynamics title.